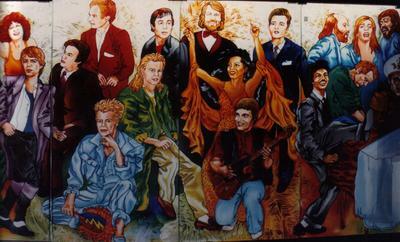 This is the illuminated wall mural in the Club X nightclub I created in 1988. It featured the icons of music from Frank Sinatra right through to Michael Jackson - and everyone in between! It was 9 panels of acrylic sheets lit from behind, each one 8 foot by 4 foot in dimensions. It was a massive 36 foot long by the time it was finished, and I also created a couple of other smaller panels for above a bar, and above a staircase down to the basement cocktail lounge. Huge job, earned me a lot of money, and I had no idea how on earth I would be able to create portraits in this liquid stained glass overlay medium. I had to draw the cartoons on paper for the portrait and the body, then lay an acrylic sheet over it. When that was dry I would use an eyedropper to drip highlights and shadows of the faces. Then when that was dry I would drip the foundation base color for the faces. I would then use a paintbrush to gently move and blend the edges of the first layer of stain that was now softening up, but not totally liquid. So after a while I managed to create a technique that would allow for 'layers' of liquid stains to be applied, drying each layer one at a time. There was absolutely not way I could 'paint' the portraits like I was used to with oils etc. Can you possibly imagine what it is like painting a 36 x 8 foot mural in liquid with an EYEDROPPER??? An amazing job, that took me over 6 months full-time daily work to complete it. And you have no idea how difficult it was to find the images to draw from!!! All the books used photos that had 'novelty' angles and styles in their images! 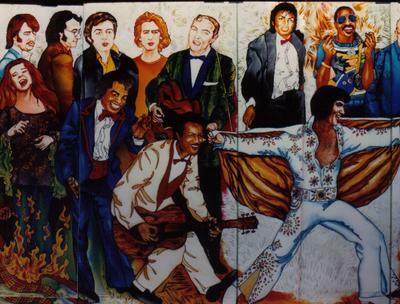 And Elvis and Marilyn do NOT look like we imagine them to, from our pop art icon images burned into our memories. 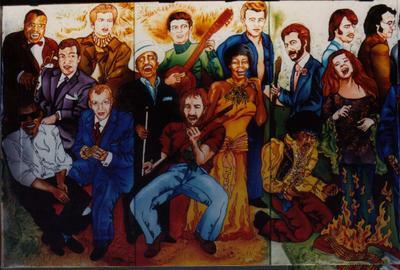 It was an amazing time of my life when I worked on this wall mural, I don't necessarily think that the actual portraits are very good, and I had terrible problems with body proportions, layering each on the 'stage' - BUT I'm proud that I managed to make this thing happen AT ALL - lol! 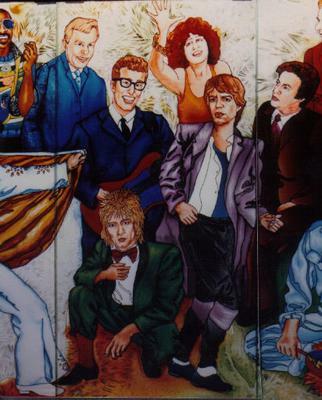 The X Club disco nightclub is now long closed - no idea where the mural is now. I hope someone somewhere is still taking care of it and enjoying it. I'm curious to know if any of the readers who stumble onto this page actually like the finished product I created? This was a mammoth project, and it had to be created in less than 5 months from the start to installation time for the opening of the club! I personally love some of the portraits, but some of them I'm a bit "meh.." about.